Bihar Police SI Syllabus 2019 (बिहार पुलिस एसआई पाठ्यक्रम पीडीएफ- दारोगा परीक्षा पैटर्न डाउनलोड): Bihar Police Sub-Ordinate Service Commission (BPSSC) has published the Bihar Police Sub Inspector Syllabus Pdf for the written examination best preparation. The Written Exam will be completed in two stages: Prelims & Main Exams. 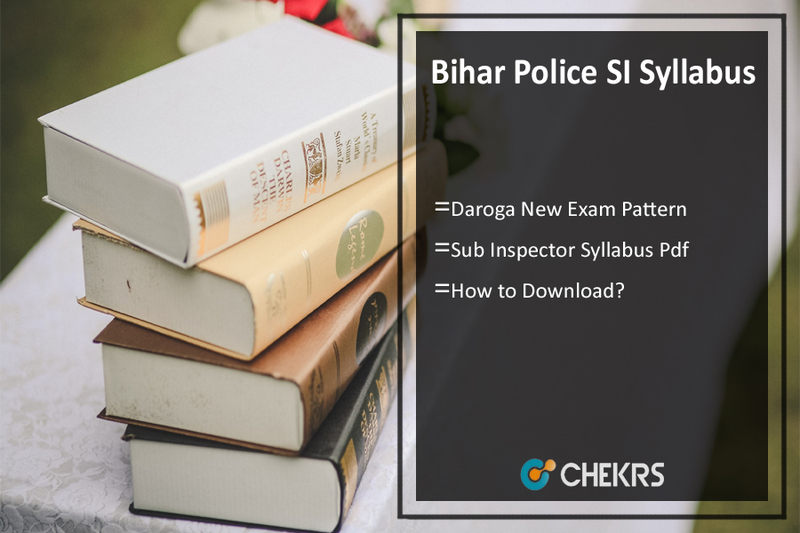 Applicants who want to participate in the Bihar Police Recruitment Examination for the Sub Inspector/ Daroga posts can download the Bihar Police SI New Syllabus Pdf and you can also check the Exam Pattern Details from here. Latest Update: BPSSC is going conduct the Bihar Sub Inspector Exam 2019 in the upcoming months. Candidates can check the Bihar Police Sub Inspector Syllabus, prelims & mains exam pattern from here. The Bihar Police Recruitment board will conduct the Written Examination for the Sub Inspector Posts to recruit the well skilled and talented candidates for the various vacant posts. And for this selection candidates will need Bihar Police Daroga Exam Syllabus. The exam syllabus indicates the topics of which question will be asked in the Bihar Police SI Recruitment 2019. The Bihar Sub Inspector Exam Pattern 2019 described the question distribution, marking scheme and time duration and also checks negative marking details. All candidates are informed that understanding the exam scheme before would make the understanding of the syllabus must easier for the candidates. The Bihar Police Daroga Exam is objective type question papers which will consist the multiple choice questions. The exam process will be completed in tow mode: Preliminary & Main Exams. Here we have shared the Bihar Police SI New Exam Pattern for pre & main exam paper. The Bihar Police Daroga Prelims Exam Pattern will contain the General Knowledge/ Current event question Papers which will carry the 200 Marks and total numbers of question will be 100. The exam process will be completed in the 2 Hours. Applicants will secure the min passing marks in the exam they will be eligible for the main exam. The Bihar Sub Inspector Main Exam Pattern will contain the Two Papers: Paper-I & II. Each paper consists the several subjects and each paper will carry the 100 questions and each question will be 2 marks. Each paper will be complete in two hours. There will be the two examinations and all questions will be objective multiple choice question. The exam Papers will consist the different subject. If the candidates want to qualify for the Bihar Police SI Examination Process to get the Government Job in Bihar State can check the Bihar Police SI Exam Syllabus topic from here. Go through the syllabus mentioned below and get complete details. Current Event- National & International, General Science, Indian Culture & Heritage, Indian National Movement, Countries & Currencies, Indian History, Science & Technology, Indian Geography, Constitution, Countries & Capitals. Understanding Media, Unpacking Gender, The Constitution, Parliamentary Government, The Judiciary, Social Justice and the Marginalized also, Diversity, Government, Local Government, Making a Living, Democracy, and State Government. Political Developments, Culture and Science, New Kings and Kingdoms, Sultans of Delhi, Architecture, Creation of an Empire, The First Empire, Contacts with Distant lands, Social Change, Regional Cultures, The Establishment of Company Power, Rural Life and Society, Colonialism and Tribal Societies, The Revolt of 1857-58, Women and reform, Challenging the Caste System, The Nationalist Movement, India After Independence. Air, Water, Human Environment: settlement, transport, and communication, Resources: Types- Natural and Human, Agriculture also, Geography as a social study and as a science, Planet: Earth in the solar system, Globe, The environment in its totality: natural and human environment. analogies, similarities, and differences, space visualization, problem-solving, analysis, judgment, decision making, visual memory, discriminating observation, relationship concepts, verbal and figure classification, arithmetical number series, non-verbal series etc. Physical Eligibility Test. The candidate’s selection will depend on the Written Examination and Merit List. After completing the written Examination process, the exam authority will display the merit list. So candidates are informed that use the Bihar Police SI Syllabus 2019 details from here and can start their exam preparation to score the good marks in the written exam. If you have any query about Bihar Police Daroga Exam Pattern, Syllabus that you can write comments on the commenting box and take a review or feedback.